Suren Madanayake, Managing Director ACL Cables PLC together with Thusitha Suraweera, Head of Card Centre, Commercial Bank PLC presented this unique debit card to electrician S.M.C.P. Sampath. Senior Relationship Manager, Nelum Wasala and Relationship Manager Sarani Bandara of Commercial Bank, were also in attendance for this occasion. 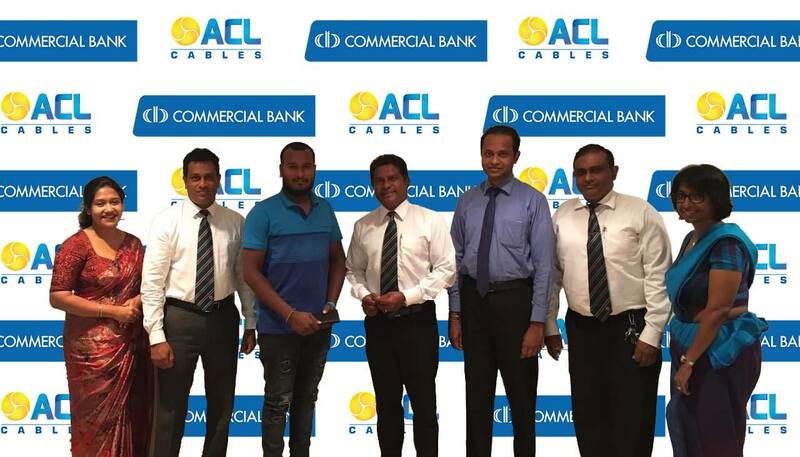 The ACL-Commercial Bank Debit Card was launched a year and half ago by ACL Cables as the first novel co-branded card for electricians by a company in the cable industry to facilitate easy transactions. “We also appreciate that all our electricians have faith in us and in partnering ACL to take this novel concept forward and make it a success. As a result, most electricians today are willing to move towards the trend of cashless transactions and are comfortable in using their cards having grasped our intentions behind this project,” Madanayake added. Partnering ACL on this note-worthy venture, Commercial Bank have signed an agreement with ACL Cables in issuing debit cards for the convenience of electricians including exclusive service terms for the sole benefitof the electricians. “We recognized that electricians are a key stakeholder group in ACL Cables’ business operation. As Sri Lanka’s leading private bank we were delighted to work together with the nation’s number one cable manufacturer on this novel initiative,” Thusitha Suraweera noted. Commercial Bank is the only Sri Lankan bank to be ranked among the Top 1000 banks of the world for seven years consecutively; Commercial Bank operates a network of 261 branches and 759 ATMs in Sri Lanka. The Bank has won more than 30 international and local awards in 2016 and 2017 and has over the years received multiple awards as Sri Lanka’s Best Bank, Best Trade Bank, Strongest Bank and Most Respected Bank from a number of local and international institutions and publications. ACL Cables continuously seeks to uplift the professional capabilities and livelihoods of electricians and has initiated many activities benefitting these tradesmen. These include conducting a series of knowledge sharing and mentoring sessions catering to all electricians’ island wide and special life insurance schemes for their safety. Today, ACL Cables operates as the industry leader with over 70% market share and a turnover of LKR 14.5 billion as a group. ACL’s innovative products include a range of cables, which cater to industrial and domestic use, electrical switches sockets, ceiling fans and many more electric accessories.